Jonas, Justus, p. 605, ii. At lines 8-12 it is stated that he adopted the name of Jonas in 1519. In the Wittenberg Matriculation Album his name appears in 1511 as “Jodocus Jonas of Nordhausen." He was thus known as Jonas as early as 1511. 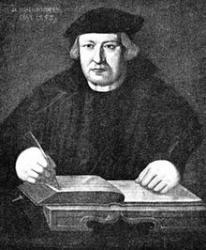 Justus Jonas (5 June 1493 – 9 October 1555) was a German Lutheran theologian and reformer. He was a Jurist, Professor and Hymn writer. He is best known for his translations of the writings of Martin Luther and Philipp Melanchthon. He accompanied Martin Luther in his final moments.